688 pages | 108 B/W Illus. 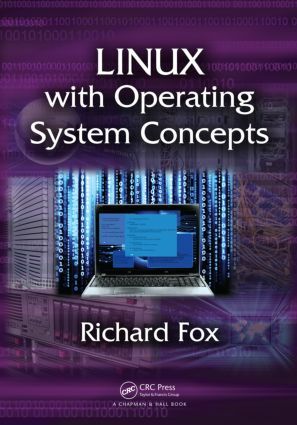 Linux with Operating System Concepts merges conceptual operating system (OS) and Unix/Linux topics into one cohesive textbook for undergraduate students. The book can be used for a one- or two-semester course on Linux or Unix. It is complete with review sections, problems, definitions, concepts, and relevant introductory material, such as binary and Boolean logic, OS kernels, and the role of the CPU and memory hierarchy. The book covers Linux from both the user and system administrator positions. From a user perspective, it emphasizes command line interaction. From a system administrator perspective, the text reinforces shell scripting with examples of administration scripts that support the automation of administrator tasks. The author incorporates OS concepts not found in most Linux/Unix textbooks, including kernels, file systems, storage devices, virtual memory, and process management. He also introduces computer science topics, such as computer networks and TCP/IP, binary numbers and Boolean logic, encryption, and the GNUs C compiler. In addition, the text discusses disaster recovery planning, booting, and Internet servers. "The intent of this text is to provide both use and administration details for Linux, as well as more general concepts of operating systems. …The writing style is almost conversational…The coverage is quite good… and there are many helpful comments that help in dealing with the many Linux variations. This text has the potential to serve a wide variety of audiences…"
"I would strongly recommend this book as a primary textbook for a course or tutorial on the use of Linux, or as a companion reference book in an operating systems course. This is also a great book for business computer systems students, IT personnel who need to jump onto the Linux/Unix wagon, or for an engineer or engineering student who wants to learn more about a workstation that hosts his or her computer aided design software." "This book is a broad and deep look at everything you need to do to dive into Linux. Both experienced users and Linux newbies will have something to learn from this book; it’s worthy of keeping on your shelf as a reference." "This is a good book that covers a comprehensive list of Linux topics for college students. Unlike many Linux books that are written for system administrators or software professionals who develop Linux systems or applications, this book takes a unique approach and discusses the topics at a level that is appropriate for undergraduate students who are learning Linux." Chapter Review and Review Questions appear at the end of each chapter.